Ja’Kwan Hale always had the ability to jump. When he first tried out for the Derby High track and field team as a freshman, he noticed the high jump. Since then, Hale has developed into one of the top high jumpers in Connecticut, along with having postseason success in the 300 hurdles. In last season’s indoor season, he kicked off the postseason at the Naugatuck Valley League meet by winning the high jump (6 feet). At the CIAC Class S meet he won the high jump (6-7) and won it at the State Open in a school indoor record of 6 feet, 8 inches. He went on to take fourth in the high jump (6-5) at the New England meet. Hale’s success continued in the outdoor season. He won the high jump (6-2) and won the 300 hurdles (38.88, meet record) at the NVL meet. At Class S he won the high jump (6-4) and won the 300 hurdles (39.09). At the State Open he was fourth in the high jump (6-4) and third in the 300 hurdles (38.91) and at the New England meet he was ninth in the high jump (6-5). In the current indoor season, Hale is ranked No. 5 in the nation in the high jump. He will compete this weekend at the prestigious 25th annual New Balance Games at the Armory New Balance Track and Field Center in New York City, according to a press release from the event’s organizers. “Ja’Kwan had a great year last year,” Derby coach Nick DiLuggo said. “He’s versatile and even ran a leg of our state champion sprint medley relay team. He just wants to be good. Running the 300 hurdles helps contribute to his high jump success. He’s fast and explosive. But there is a mental aspect to his success in the high jump. Hale’s success as a junior was rewarded with New Haven Register All-Area selections in the boys indoor and outdoor seasons. “I was surprised by my success in the indoor season last season, I was surprised I got the high jump school record,” Hale said. “I was struggling and stuck at 6-4 at the beginning of the season and it was frustrating. I decided to change my technique a little, especially when it came to my run-up. I was taking seven steps to the bar and I increased it to nine steps. That change increased my momentum to get over the bar and I started improving. After Hale’s freshman season his family moved to Georgia for a year and he didn’t compete in track and field his sophomore year. 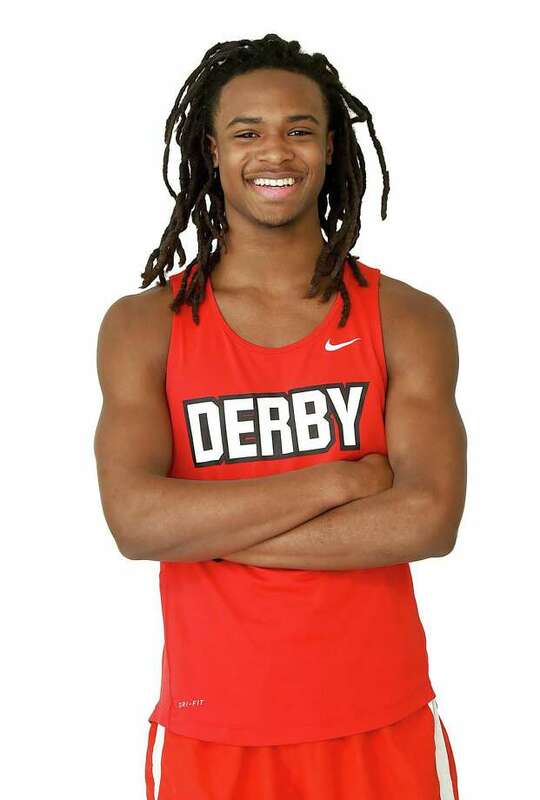 The family returned to Connecticut and DiLuggo noticed a renewed focus by Hale when he returned to the Derby track and field team as a junior. “When Ja’Kwan came back to the team as a junior, it was fun and exciting for him,” DiLuggo said. “He’s really a well-rounded athlete, deeply talented and can compete in just about any event. But he is committed more than ever now. He had a great year last season, a breakout year last season, and it’s a credit to his talent level after not competing as a sophomore. The top competition DiLuggo was referring to includes Justin Forde of McMahon. Forde is only one of a handful of high jumpers in Connecticut high school history to clear 7 feet in the high jump when he did it during the last outdoor track and field season at the Middletown Invitational. Forde has committed to compete in track and field at the University of Miami. Hale’s ultimate goal is to do well at the New England meet and qualify for the national meet in the high jump. The Hand boys indoor track team had a solid performance at the McReavy Invitational on Jan. 11 with seven top-three finishes. Russell Powell won the high jump (6-0) and was third in the 55 hurdles, Greyson McGeary was second in the 55 hurdles (8.30), Connor Parthasarthy was second in the 1600 (4:52.29), Ameen Parks was second in the 55 dash (6.85) and the Tigers won the 4×400 relay (3:39.15) and 4×200 relay (1:36.72). Spencer Brown, Immaculate: Won the long jump (21-7) and was second in the high jump (6-0) at the Shoreline Coaches Invitational. Thomas Rouffiac, Greenwich: Won the 300 (40.62) and 600 (1:34.12) at the FCIAC qualifying meet. Peter Fuller, Canton: Won the high jump (6-4) at the Wesleyan T&F Qualifier and won the high jump (6-4) at the Shoreline Coaches Invitational. Tess Stapleton, Fairfield Ludlowe: Won the 55 hurdles (8.48) and long jump (17-5) at the Yale Classic Invitational. Andraya Yearwood, Cromwell: Won the 55 hurdles (9.18) and was second in the 300 (41.98) at the Shoreline Coaches Invitational. Lily Hadin, Norwalk: Won the 50 hurdles (8.69) and high jump (5-0) at the FCIAC qualifying meet. SCC Coaches Invitational, Floyd Little Athletic Center, start time TBA: Boys and girls event. NCCC Invitational, Hartford Public High, 1 p.m.: Boys and girls event. FCIAC qualifier, Staples High, 10 a.m.: Boys and girls event.